Last night we got in fairly late but, since my meal was comped, I didn't want to miss out on some traditional Icelandic food. To my surprise, I was able to try some local fresh salmon, gnocchi (which is made from water and almond flour) and lovely dessert cakes that I definitely should not have eaten considering my dairy intolerance. I'm also delighted to report that I was able to make a few fast friends! I ate dinner with some new faces and other travel explorers. 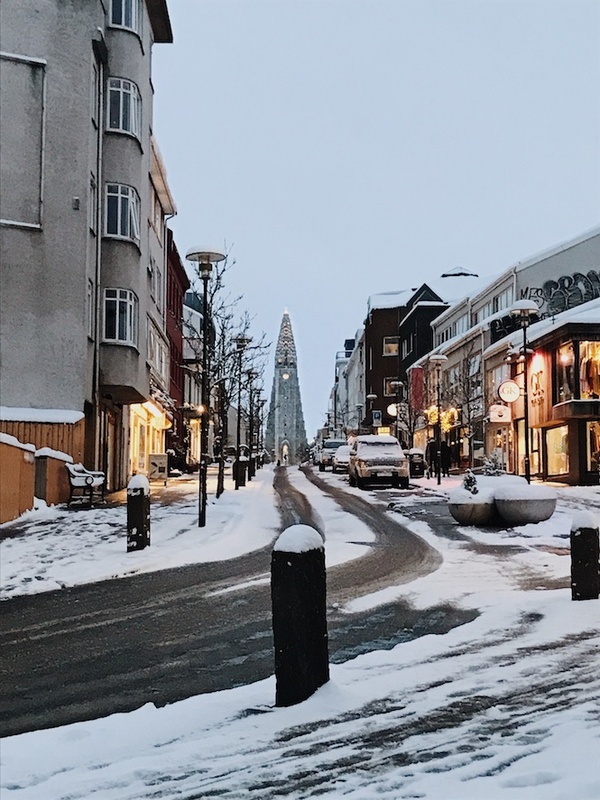 The next morning I woke up early and taxied to downtown Reykjavik alone. Grabbing a taxi is something I'm accustomed to in New York but it's not something I'd normally do because I like to try out to local transportation. However, since I only had a few short hours, in this lovely winter wonderland, I didn't want to risk being in unfamiliar territory with the bus routes. Did I mention it was snowing too? It was definitely safer to taxi. When I travel alone, my favorite thing to do is learn about the local food and traditions. So, I skipped my comped meal at the hotel and ventured out for local splendor and a quality cup of tea in the city. Conveniently my driver dropped me off near a "Bakeri" with Icelandic "Kleinur" (local donuts!). The perfect bite before my 3 hour walk afterward. As you can see above, this place was graffitied with modern art and odes to an Iceland of the past. Friends, I was absolutely smitten with this lovely city. Everyone is so kind, happy to educate or make a recommendation. Plus, the snow really wasn't so bad! I only slipped once and I saved myself pretty quickly. My beautiful Vince Camuto's took a bit of a beating. Nothing a little trip to the cobbler won't fix though. I mustard up the courage to ask a few strangers to take some pictures of me while I was out and about. It was impossible to take any OOTD photos for you but I'm so thrilled to have these photos for my travel wall. 1) I am grateful to have the privilege and ability to travel abroad. 2) I am so incredibly thankful for all the worldly knowledge my grandmother bestowed upon me about traveling, making friends and wandering to find hidden gems. I truly felt her with me on this mini mishap. 3) I am grateful for my courage, adventurous spirit and willingness to convince myself to make the most out of every situation. Especially when unexpected. 4) I am also thankful that I can build outfits out of clothes I brought for a 5 day trip and not 6! 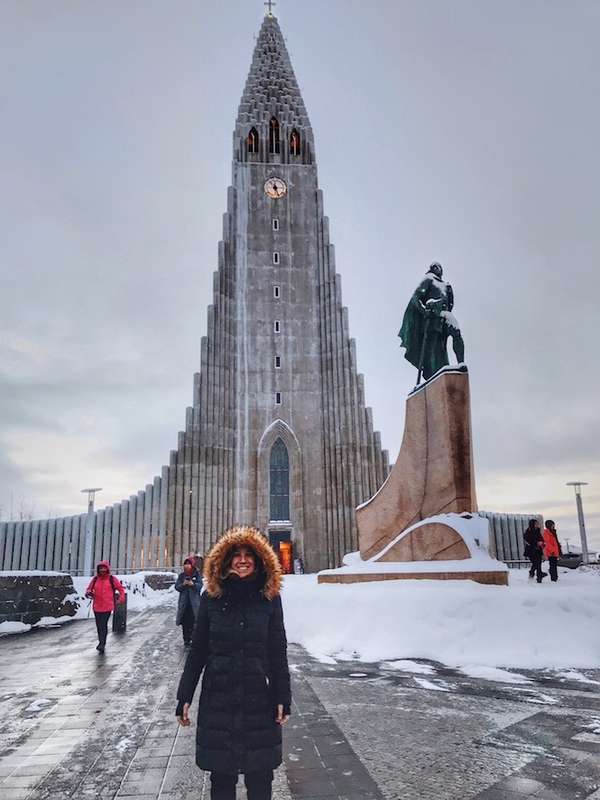 So, after wandering the city of Reykjavik, I didn't get to see it all so I will absolutely be back someday. It was such a fun mini adventure and I'd love to explore it again but this time with my Dad. He would love this city! Have you ever been stranded in an unknown city or country? How did you make the most out of the experience? My Recent Trip to Paris: What to do in Winter.